Great selection of breakfast items. We had more than enough for our stay. Loved that you had a coffee machine with capsules. I am a nespresso coffee drinker, so I loved it. A very modern and well-equipped cottage, had everything you need. Grant the host was very welcoming and helpful. Fantastic view. Wish we could have stayed longer. You can see wild kangaroos in the private cottage and the glasshouse is well designed with taste. Excellent to someone wants to stay in a natural environment and living in modernizing accommodation. I really enjoyed my stay at Glass. I will be going back for a longer stay. The owners were very helpful and kind. This was my first night after a long flight from the USA and it was so quiet and restful after that flight. The entire cottage was beautiful, comfortable, quiet, private, very clean, and the fittings very good. The breakfast supplied was fabulous, with more than enough food. Loved every minute of my stay here. The cottage was incredible and the perfect night away. Lock in a great price for Glass On Glasshouse – rated 9.8 by recent guests! Glass On Glasshouse This rating is a reflection of how the property compares to the industry standard when it comes to price, facilities and services available. It's based on a self-evaluation by the property. Use this rating to help choose your stay! The air-conditioned Glasshouse Cottages have wooden floors, floor-to-ceiling windows overlooking the mountains, and a fireplace in winter. All units come with a flat-screen TV, Blu-Ray DVD player and an iPod dock. The café offers views of Mount Coonowrin, and guests can usually spot a kangaroo under the mango trees. It provides breakfast, lunch and snacks, including home-baked treats and traditional afternoon tea. Glass On Glasshouse is located 18 minutes’ drive from Steve Irwin’s iconic Australia Zoo. Caloundra Beach is a 40-minute drive, and Brisbane is a 50-minute drive away. Guests can get sightseeing advice.The on-site gift shop is the perfect place to find a special souvenir to take home. 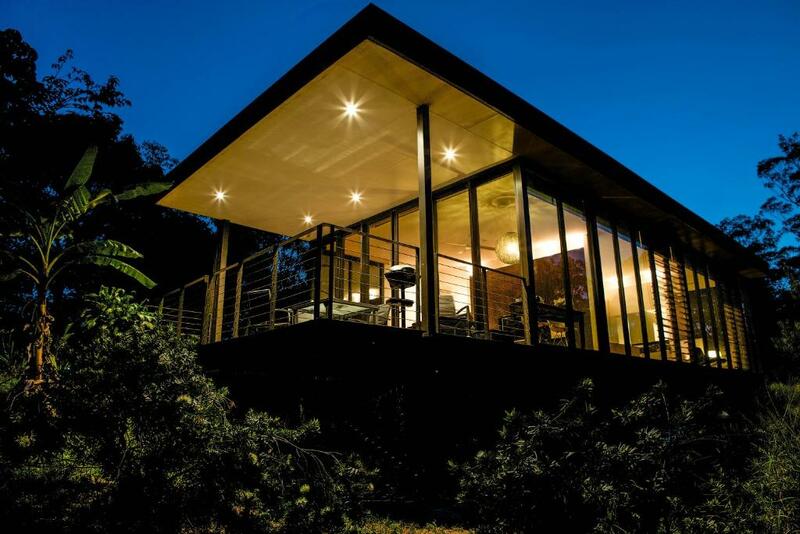 This property also has one of the top-rated locations in Glass House Mountains! Guests are happier about it compared to other properties in the area. When would you like to stay at Glass On Glasshouse? This cottage features a double spa bath, floor-to-ceiling windows and a private patio with lovely views of the Glasshouse Mountains. Please note that the 3rd guest will be accommodated on a sofa bed in the lounge. Grant & Darrell have recently taken over from Bill & Misao Rogers who had been running Glass on Glasshouse for about 6 years. It took several years to find such an idyllic spot, surrounded by farms and forests yet only 50 minutes from Brisbane and then we found Glass on Glasshouse! Prior to this we owned a successful 5 star BnB in New Zealand. We are away from the hustle & bustle, so if you are after "city lights" you are going to come to the wrong place. We are set in the heart of the Glasshouse Mountains with some great walks and hikes close by. You get fantastic views from the top of the mountains, and I'd thoroughly recommend Mt Ngungun which is a 40 minute walk to the top where you are rewarded with outstanding views. I'd also recommend spending a day exploring the Maleny and Montville townships & Mary Cairncross Rainforest. Of course we also have the World Famous Australia Zoo a short drive away. 500m up the road is The Lookout offering views of all the Glasshouse Mountains and all the way to the coast. A beautiful spot to watch the sunset or for the early birds catch a spectacular sunrise !! House Rules Glass On Glasshouse takes special requests – add in the next step! Glass On Glasshouse accepts these cards and reserves the right to temporarily hold an amount prior to arrival. Please note that Glass on Glasshouse requires a AUD 500 credit card pre-authorization upon check in to cover any incidental charges. When you arrive at the gate (just after the cafe), please call the phone number displayed next to it. If you do not have a mobile phone, please call the hotel prior to your arrival to confirm your expected arrival time, using the contact details found on the booking confirmation. Please note that a 3% charge applies if you pay with an American Express credit card. Please inform Glass On Glasshouse of your expected arrival time in advance. You can use the Special Requests box when booking, or contact the property directly using the contact details in your confirmation. 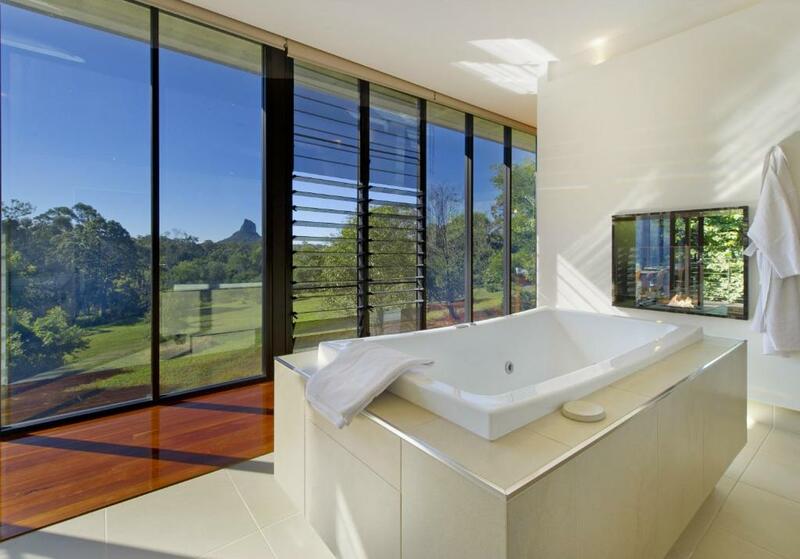 Incredible architectural glass cabin with incredible views of the glasshouse mountains. Beautiful room, very well set up, luxurious and perfect for a couples get away or honeymooners. Everything is in perfect condition and very very clean. Very nice villa with stuning views. The owner is very friendly and helpfull. We loved the breakfast at the restaurant next to the property. Private, well appointed and modern, great view. There was nothing we could fault with the place, the cottage and location was simply amazing. The setting, the design and layout of the luxury cottage, the facilities and the relaxed retreat feel. Simply stunning I wish I was there for a week. Hands down is one of the nicest places I have ever stayed. I could have sat on the deck and watched the world go by quiet happily. Beautiful views and a beautiful place to stay, photos do not do it justice. I work internationally and love to get away for a night or two of peace and quiet by myself and I have found my new favourite place on the Sunshine Coast. Wonderful staff who where happy to help wherever needed.